Tide PODS Spring Meadow Scent Laundry Detergent Pacs are a 3-in-1 laundry solution, that consist of a detergent, stain remover and brightener all at once. Simply pop in one pac for small/medium loads, but use two pacs for large loads and three pacs for extra large loads. 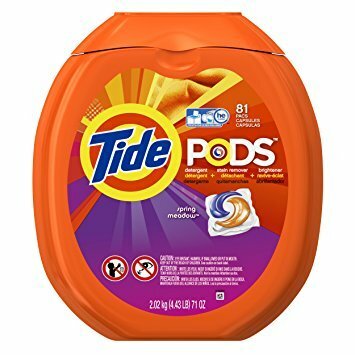 Tide PODS quickly dissolves in any temperature, and can be used in front and top loading washing machines, both standard and high efficiency. Its Spring Meadow Scent infuses your laundry with fresh floral notes to help leave your laundry smelling amazing. For a simple yet effective laundry experience, Tide PODS is the all-in-one solution you've been looking for! It is formulated with HE Turbo technology for 6X the cleaning power in half the time (1) Unlike many other HE detergents that can slow washers down because of too many suds, Tide HE Turbo contains quick collapsing suds and targets tough stains. So you can get amazing results without the extra rinse cycles to remove the suds. This container will keep you covered for 81 full loads. (1) based on stain removal performance of one pac of Tide PODS vs. six doses of the leading liquid bargain brand base variant in a standard top loading machine. If you have any questions about this product by Tide HD, contact us by completing and submitting the form below. If you are looking for a specif part number, please include it with your message.